Recently, I published a post called Graceful, about my spectacular clumsiness. Several of my friends who have known me for some time commented that I was too hard on myself and that they didn’t consider me particularly klutzy. They may have reopened Pandora’s box. After considering this feedback, I thought it might be time to rethink my position (especially if that position is inclined to be unstable…. I am much better off on firm ground!). 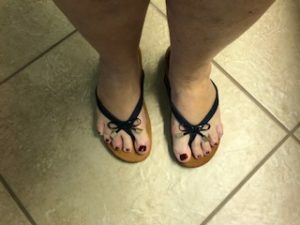 In keeping with my quest to open myself up to new experiences and bolstered by my friends’ confidence in my ability to remain upright, I decided to buy a new pair of flip flops. I didn’t completely throw caution (and several years of painful experience) to the wind. I did some research and discovered Vionic sandals. Vionic shoes are supposed to be great for your feet, ankles, legs, hips, back, neck, shoulders, and maybe even your spleen. They make flip flops in all kinds of cute colors and patterns. Online reviewers rave about their comfort and orthopedic splendor. They are expensive, but people swear they are worth every penny. Surely, I reasoned, if this company is all about health and foot safety, their designs must be less perilous to the dexterity-challenged than the $12 Old Navy variety of flip flops. I plunked down my credit card at the local department store and bought a pair of these cloudwalkers. I took them home and began to wear them the next day. Time will judge the wisdom of this decision. I am hopeful, however. Retirement really is about making fresh starts. It is the perfect time to try activities for the first time. It is also the perfect time for trying a second take if something didn’t work out so well the first time. In retirement, the stakes for experimenting are both higher and lower than they were when I was working. The stakes are higher because, as I age, it becomes clearer to me that my time in this world is limited. If I don’t try things I want to explore now, there might not be another chance. On the other hand, the stakes are lower because I am the only one who defines success and failure now. There are no bosses to disappoint. There is no annual review to make me feel inadequate. It is up to me to decide what success looks and feels like. For me, the success is in the trying and allowing myself to delight in the attempt. It is pretty cool to do something that you’ve always wanted to do. It is pretty cool to do something that has always scared you in the past. It is pretty cool to consider yourself a winner, even when the product resulting from your effort is a bit of a loser. I’ve done a lot of new things in the past several years. I’ve moved across the country. I’ve learned to be part of a community. I’ve spent days swimming with dolphins. I’ve started a blog. I’ve published a book. I’ve painted a picture. I’ve given a party. I’ve gone Christmas caroling. I’ve started doing water aerobics. I’ve changed religious affiliation. Some of these endeavors have yielded beautiful results; others not so much. I can say, though, that every single one of them has brought me pleasure and delight. I consider all of them to be unmitigated and absolute successes! We’ll see how Take Two with the flip flops goes. So far, all is well with my experiment into foot fresh starts. However, if you hear of any freak flip flop related fatality, you will know why Terri LaBonte is no longer publishing weekly blog posts. Have you had an experience with a “fresh start?” Have you tried something again that you had previously abandoned? What was that experience like for you? Please share your perspective by leaving a comment. In the alternative, you can email me at terriretirement@gmail.com. Have a flip floppy kind of day, without actually flopping!